This centre is an independent unit of special nature, on technical, financial and managerial ground. It has been established and started its activities in 1988. The centre aims at consolidating the links between the university and private as well as governmental institutions and organizations with the view of fostering the role of universities to the integrated development of the country. • Offering continuous engineering education and training courses especially in the field of mechanical power engineering. • Conducting joint research and studies with the industrial institutions in order to assist in its development and to provide techno-economical solutions for industrial problems. • Providing technical service and consultation for industrial organizations. • Conducting performance tests and calibration of equipment. • Offering, whenever required, technical advises in arbitration. • Helping to adopt the recent project management methods that extend to supervision of execution of work and construction management as related to the implementation of mechanical engineering projects. 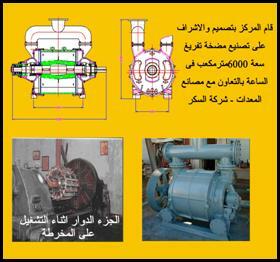 • Design, manufacture and testing of 6000 m3 / hr vacuum pump for Sugar & Integrated Industries Company (SIIC) (1998). • Preparing software for the design and planning of sugar factories (SIIC) (1999). • Consultation activities for the Gabal El-Asfar Sewage Plant and Eastern Pumping Station- Cairo Wastewater Organization ( CWO ) (1995- present)-. • Supervision of manufacture and testing of pumps at the Equipment Factory- Sugar & Integrated Industries Company (SIIC) (1998 – 2000). • Assessment of a complete system for prevention of dust emission – The General Company for Silos and Storage (1999). • Study, prepare tender documents and assist in procurement for replacing sanitary watre furnaces – EPAP and the General Company for Refractory and Ceramics (Chini) (2000). • Study of turbines troubles at El – Kuraimat thermal power station (2001-2002). • Fire fighting and alarm systems design at some Cairo University installations (2000). 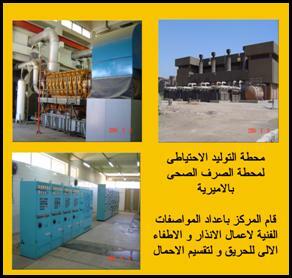 • Preparation of technical specifications for freezing units and refrigeration lines- West Nubaria Project (1999 – 2000). • Environmental Impact Assessment- North Cairo Mills (2000). • Technical studies for developing engineering and calibration labs. – Egyptian Organization for Standardization & Quality Control. 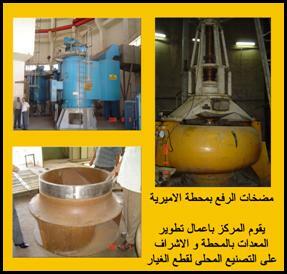 • Air – conditioning and sanitary work studies for the Saudi Egyptian Construction Company (1999- 2000)..
• Technical studies for development of some equipment of Ameria Tunnel Pumping Station-Cairo Wastewater Organization ( CWO ) (2000 – present)..
• Design and follow up the manufacture and installation of a 1.2 cubic m/s – irrigation pump (SIIC) (2003-2005). • Assessment of refrigeration system and preparation of modification plans at the Paste and Juice Company (P&JC) – Sadat City, Egypt (2005). • Preparation of environmental protection plan for the industrial waste water at the Paste and Juice Company (P&JC) – Sadat City, Egypt (2005). 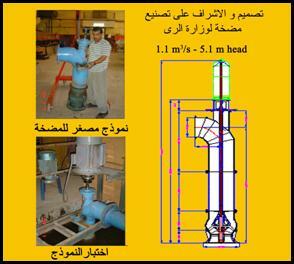 • Preparation of technical specifications for Marashda & Om-Doma Sewage Plants (2005). • Manufacturing of 6 remotely controlled electrical screens for data show display for the Faculty of Engineering- Cairo University (2005).